How do I login to my profile when I don't have login details? Go to the Login tab at the top of the Home Page, enter your email address you registered with and then click the 'Forgotten password' link. You should then be sent details on how to create a new password and to login. How and when do I get my race number? Your race number will be listed on your profile the week of the event. 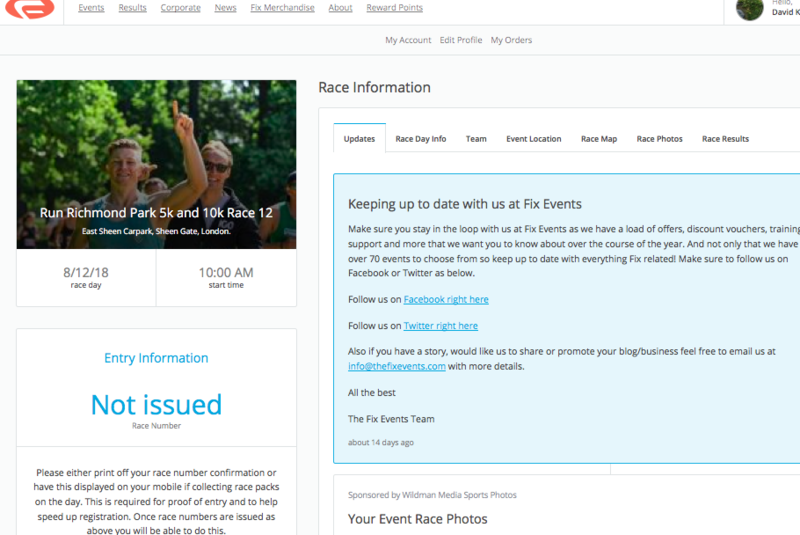 You will receive an email notification when your race number is live in your profile. At this point all race numbers can be found on the event page of the website (half way down the page under Race Information). You will need your race number to register and collect your race pack on event day. You collect your race pack at registration on the morning of the event. You will need your e-ticket and/or race number to collect your race pack on event day. You race number will be in your profile and on the event page of the website the week of the event. Yes, your event race list will be online approximately a week prior to your event. Please make a note of your race number as you will collect your race pack on the morning of the run. 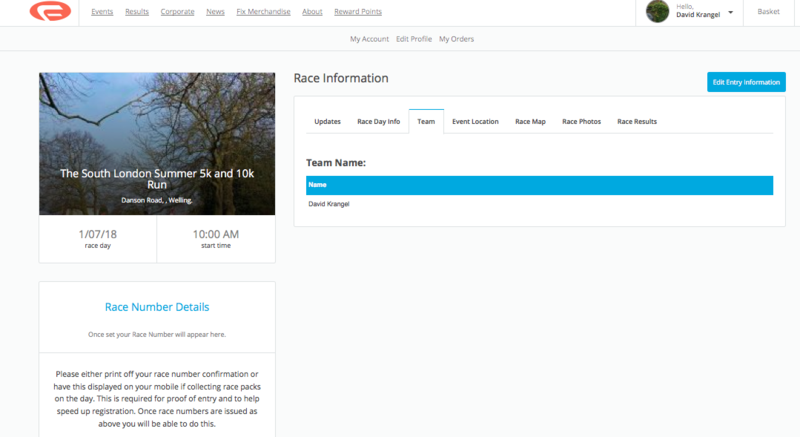 Race numbers will also be on individuals online profiles. Absolutely! Get as many friends, family or colleagues together to join you. Make sure everyone you want to be in your team uses exactly the same team name when booking. Teams of 4 or more running the same distance get a 10% team discount when entering online. Use the discount code MR18-TeamEntry to get your discount! How do my friends and I create a team if we register individually? It's easy, just log in to your profile and under the event you have entered click on edit entry information and add the team name in there if you didn't do this at the point of entering the event. Yes we send out pre-event emails giving you updates on your race, information from partners and general details to get you ready for race day. You will receive a number of emails which include your race number details. These are all stored in your online profile as well. If you don’t receive your race emails it may be because the wrong email address was inputted or the race email went in to your junk mail so please do check your junk mail carefully! All your race information is stored in your online profile and your race number will also be listed here the week of the event. Please login to check all your information. If you have forgotten your password, login with the email you used to sign up with and then request a new password. All race day information will also be on the event page of the website and a race listing with your race number will be online the week of the event. We typically have some on the day entries available, if the event hasn't sold out. Details will be posted on the event page of the website at the beginning of the week of the event confirming details for on the day entries. When do online entries close? Unless the event sells out, we typically close entries 5 days ahead of event day. After this point information on how to enter on the day will be posted on the event page. Can I cancel/transfer/get a refund if I can't take part? The Fix Events refund policy is: You can cancel up to 14 days before the event and receive a 60% refund. Or, you can choose to transfer your registration to another Fix Event (£5 transfer fee applies). To do so you must email info@thefixevents.com, 14 days ahead of event day. Unfortunately after 14 days we cannot give refunds or transfer to another event. However, you can transfer your place to someone else right up to event day itself. They will simply need to register on your race number and then see our race timing crew, Results Base and they will make the change in entry detail then. I have entered my child for Mini MoRunning, can I run with them as well? Yes, one adult can run with their Mini Mo free of charge! The adult does not need to register. However, Mini Mo medals are given to the children, not the accompanying adult. I've entered my child in to the Mini MoRun. How do I view their race number? If you enter your child or children in to the Mini MoRun and tick you are their guardian, their race details will appear within your profile. 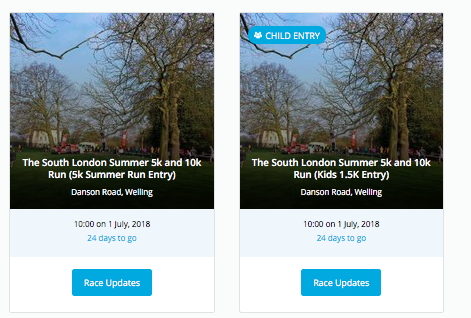 (You do not need to provide a separate email for Mini MoRunners when you tick guardian) To view the children you have entered click on the link that says child entries and their names will appear in this section. Can I run with my child in the Mini Mo if I am doing the 5k (or 10k) event? Absolutely! Typically the Mini Mo races start at 9.30am, giving you enough time to run with your child ahead of the 5k event at 10am and the 10k event at 10.10am. I've already registered, can I still buy a t-shirt? Can I walk a MoRun? We allow some walking for our 5k events but due to time constraints the 10k events must be predominately running/jogging with a bit of walking, if necessary. We typically have a cut off time of 1.5 hours to complete the race in from when the race starts. Do you have a cut off time to complete the run in? We typically have a cut off time of 1.5 hours to complete the race from when the event starts. If doing a virtual MoRun you have the whole of November to complete your run in! Absolutely! We typically allow children of all ages to take part in all our events (unless specific information is given for a set event). Please note that children remain the responsibility of their parents/guardian throughout our events. If the parent/guardian is satisfied the child/children can confidently run unaccompanied they may do so, with a parent/guardian remaining onsite at all times. Younger kids can enter our Mini Mo event from age 3 to 12 years inclusive. Children who are capable of completing a 5k or 10k distance are also welcome to join us for the main events, if the parent/guardian is confident their child can complete the course. Not as such. We typically allow children of all ages to take part in all our events (unless specific information is given for a set event). Please note that children remain the responsibility of their parents/guardian throughout our events. If the parent/guardian is satisfied the child/children can confidently run unaccompanied they may do so, with a parent/guardian remaining onsite at all times. Will I be chip timed? Yes, all our events (unless otherwise stated) are chip timed! Chips are located on your running bib, which you collect at registration on event day. Pin your race number on the front of the top you will run in. This will ensure you are accurately timed (and photographed)! Please note that the Mni Mo event is NOT chip timed. How do I find out specific course information i.e. hilly/terrain/buggy friendly? 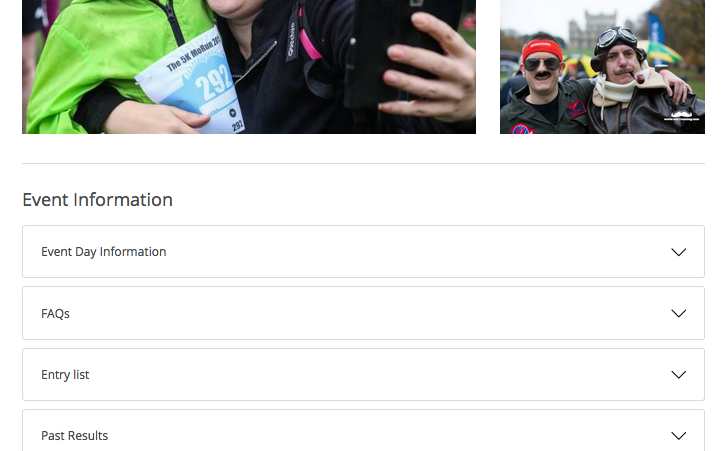 Please go to your specific event page and then open up the Race Map, which can be found about 2/3rds of the way down the page, below the MoRunning video. Here you will find info on gradients, terrain, if the course is suitable for buggies / wheelchairs and the like. Full race chip timing with instant results at the event, MoRunning headband, a super awesome medal, drinks, snacks, Champion medals for winners and an all round highly professional and fun event to be part of. Note - Mini Mo's also get a t-shirt within their entry package. Yes. We have a very special Champion Mo Medal and Champions T-shirt for our winning male and female in the 5k and 10k events. We also have Legend Mo Medals for spot prizes for the best fancy dress costumes. Yes that's absolutely fine. Please just make sure your dog is on a lead and that you are careful on the course and respect other runners and park users. Yes we do allow this but please note it is your responsibility to make sure you can hear what's going on around you when running, including marshals and general public. Can I do a Virtual MoRun outside of the UK? Absolutely! You can do a virtual MoRun anywhere in the world! Sign up, submit your time and distance after your November MoRun and we will send you your awesome Mo Medal and MoRunning headband! Absolutely! If you miss out on a place or just want to help out on the day and marshal that would be great. We need as much help as possible to ensure we can give runners the best experience possible and that includes plenty of marshals on the course, helping with registration, bag storage, water stations, handing out medals and general event support. Typical volunteer hours are from 8am until around 12pm and all volunteers will get drinks, snacks and a free entry to any Fix Event!! Please get in touch by sending an email to info@thefixevents.com. We would welcome you to join our team. Do I need to fundraise for the Movember Foundation? Alternatively you can make a one off donation during your entry. Please also note you can fundraise for any charity of your choice. How does MoRunning support the Movember Foundation? How do I view my race day photos? You are guaranteed a minimum of two photographs from the day otherwise you can claim your money back. Although you are only guaranteed two you can usually expect to receive many more, meaning that this offer represents real value for money.